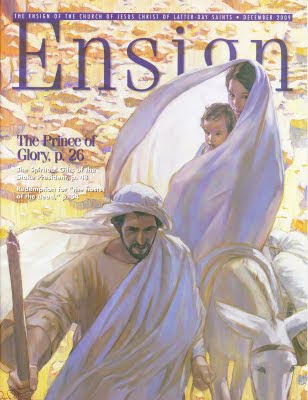 "Flight" just came out on the cover of the December 2009 Ensign Magazine. This painting is part of the permanent collection of the Museum of Church History and Art of the Church of Jesus Christ of Latter-day Saints. Yeah, yeah, yeah, yeah, yeah!! What a Beautiful answer to prayer. So wonderful to be on the phone w/ you when the Ensign came, and I opened my mailbox. Incredible blessing from the Lord! He is so tender-hearted to give us these incredible moments as "missionaries" together! Love you so much . . . and so grateful for all you do for the Lord. Rose, you are so talented! I was excited to see your artwork on the cover of this month's Ensign. Congratulations! Rose! SO amazing. I couldn't resist smiling when mine came in the mail...so proud of you! Thanks, Jackie for being a one-woman cheerleading squad! Thanks so much for the sweet and generous comment, Allie! Marci, you are too cute! Thanks so much! Can't wait to get painting together really soon! We love your work and have had several people ask us if we know whether prints of your work are available. We are a fine-art printing company in Utah, working with artists from all over who are looking for great quality and service. We'd love to help you should you have the need for assistance. You can check us out at foveditions.com. I can be reached by email to scott@foveditions.com or by phone at 801-379-0345. I have loved this since our Ensign came in the mail. Do you have prints of this for sale? I was SO EXCITED to see your artwork on the December Ensign. In fact, we read a letter from the first presidency last week that talks about making sure the Latter Day Saints read the Ensign. After I read it, I gave you a “plug” on what a wonderful artist you are. Like last year, I would love to purchase a canvas(s) of your latest artwork. Please email me when you can (I have a new computer and lost most all of my contacts, but my email is the same). I’m very proud of you and hope you and your family have a great holiday. Hope to hear from you soon. Flight was by far my most favorite piece as well! I love your painting style. I am a young Mom and painter, it was so great to read your bio. I struggle with balancing both worlds. So it is so great to see someone like you, it helps me know that putting my kids first won't make my painting career suffer & that there is a season for all things. I would love a giclee of Flight if it is available yet please let me know! Thank you so much for all the comment about the painting. I am definitely working toward making prints available in the Spring. I regret that they will not be available for Christmas, but I will post the information on my blog when the prints become available so stay tuned! Thank you four your interest in the painting and for your comment on my blog. Regarding your comments about being a mom and an artist, it is indeed a perennial struggle. You know, I read a great quote in a book by Jackie Battenfield recently called "The Artist's Guide: How to Make a Living Doing What You Love" with regard to this very topic. I don't know if it would strike you the same way it did me, but she said that while in the matter of making short term and long term goals, of all the funny things to do is to decide what you want written on your epitaph, how you want to be remembered- if you want to be remembered as a painter who was a wonderful human being & loving parent, this epitaph might serve to keep us on target and comfort us when we put our families first, despite pressures, deadlines and outward demands. I wish I had read that years ago because the way she put it really hit me. It would have helped me release much better and assuage my tendency to retreat directly into my studio to get a jump on a late night session rather than maybe spending a few lingering and precious moments at bedtime with the kids first or taking a break for a mommy-daughter smoothie run or something. The latter moments will be the moments that really do count in the long run as I hear reports of children whom I have watch grow to maturity and whose parents are those I wish to emulate- they almost unanimously revere and remember those moments above any as true meaningful anchors in their lives. A relevant note is that "Flight" was painted through the eyes of a mother of 4 children, 3 of which are teenagers, so being a mother has served to inform my art. My spin on the subject matter is about the sacred role of parenthood, how parents need to move with inspiration to protect our children. So in essence, I could not have painted "Flight" without the keen (and maybe even painful) experiences of being a mother. Maybe motherhood is an opportunity to give depth and to inform us artists, however it manifests itself in the artwork. So in that sense I am excited for you! More power to you. I wish you the very best of luck. PS- FYI, my Interior Landscape Series (see right hand column with gallery) are about being a young mother, a domestic life within 4 walls. I thought that might be of interest to you. Thank you for your comments and for the plug, which was wholly unexpected! I hope all is well. I will let you know when the prints become available! You mentioned in an earlier post that there would be prints available of "Flight" in the spring of 2010. I love this painting and my children love it, too. We would love to have this hanging in our home as a beautiful reminder of our Heavenly Father's love and His ability to lead and guide and protect us through the whisperings of the Spirit. Thank you for creating such a powerful masterpiece! Please tell me how I can order this beautiful painting. Thank you for your very kind comments about the prints. I am negotiating with FOV editions right now, a printer & distributor out in Utah from whom the prints may be purchased online. So stay tuned as I will post their availability on my blog. Again, thank you for you interest in the prints! I just saw your video on mormon.org. if i'm correct and i'm inspired! i love your art!